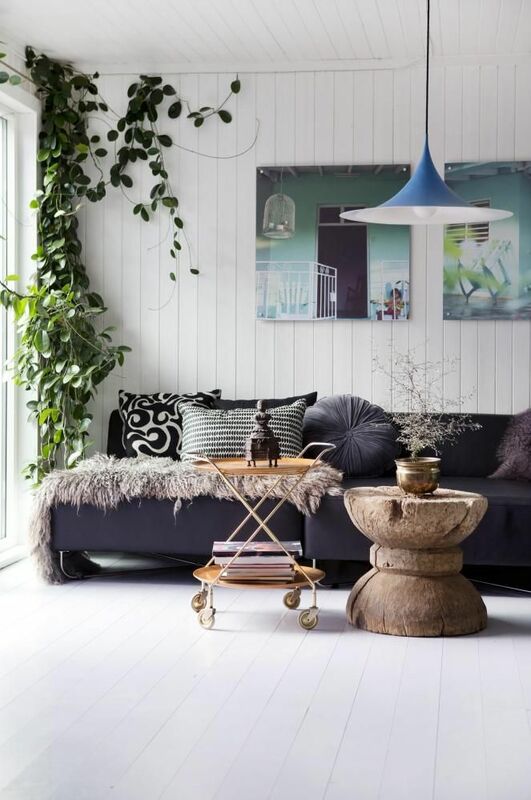 6 Ideas To Style Yourself A More Hippie Chic Home! 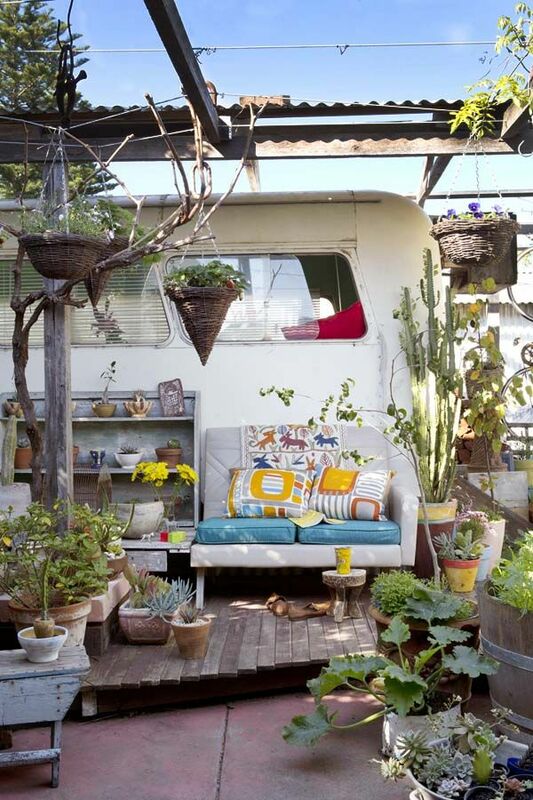 You can’t get more boho than a vintage caravan, can you?! While this is an extreme styling option for the hippie chic look at home, its an option! I happen to be inpired by the wild smattering of plants in various Earthy pots all over the place. This you can do! 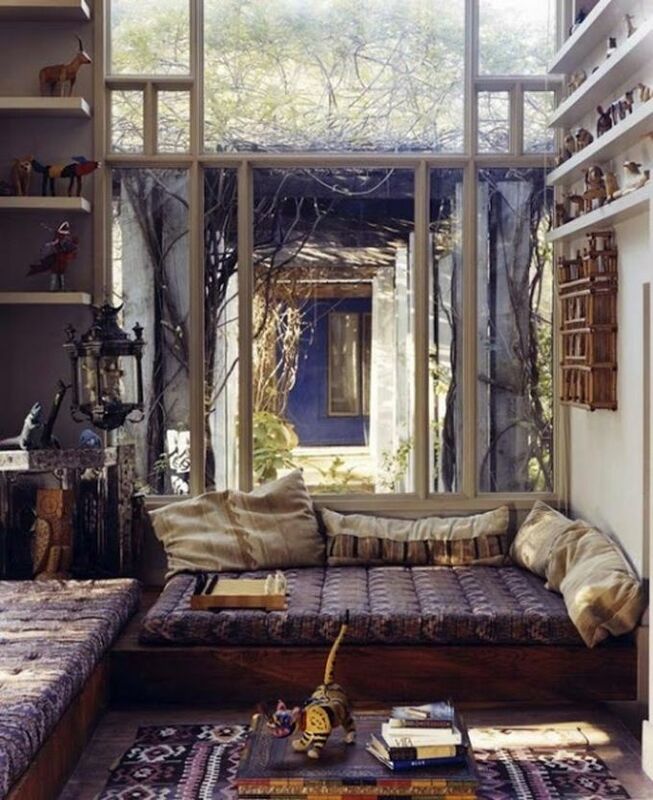 In fact, there are some great ideas to style a touch more boho into your own home and they are all quite within reach. Even the most modern of homes can benefit from a bit of free-thinking, grounded and natural that the boho lends to space…! 1. Crystals set up in brilliant ways. A vignette of crystals and artifacts can renovate a coffee table or stand-in for a centerpiece! 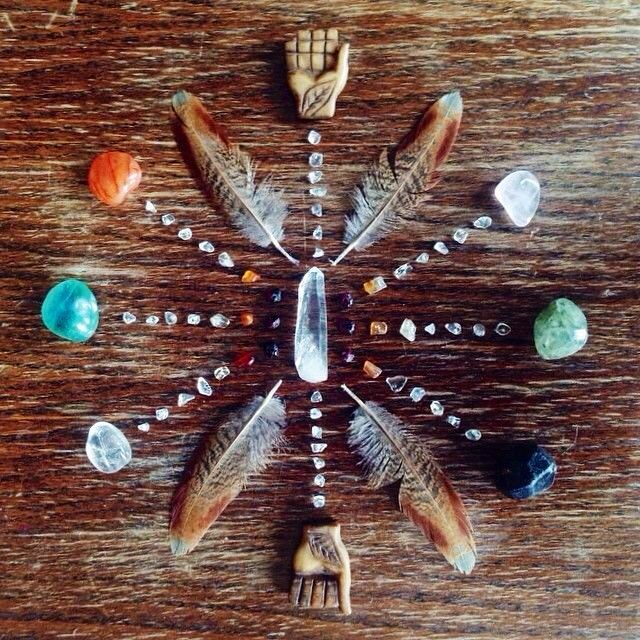 I have a bit of a penchant for crystal mandalas. If you don’t know what they are you can check them out HERE. A little of your own design hand mixed with nature creates great beauty! 2. Grow vines inside! Some indoor vines are the most far-out touch to even a simple space. Vines have a mind of their own, they know no bounds and they flourish like mad. I can’t think of better energy! 3. 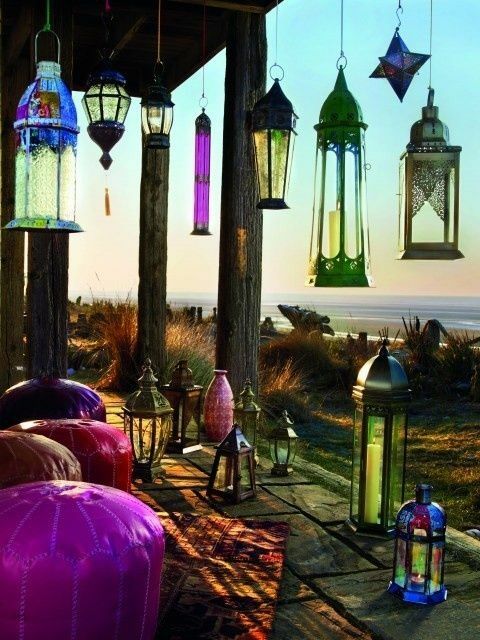 Jewel toned poufs and lanterns! Lanterns are incredible. Very inexpensive, easy to deck out in colors that are rich like rubies and amethyst, and filled with character, I even love lanterns on mantels and in the place of a firein a fireplace! 4. Platform Furniture. Love this huge platform sofa-esque idea… a meditation room bliss idea!!! you can even put mats like these cushions on the floor to be ultra simple! 5. 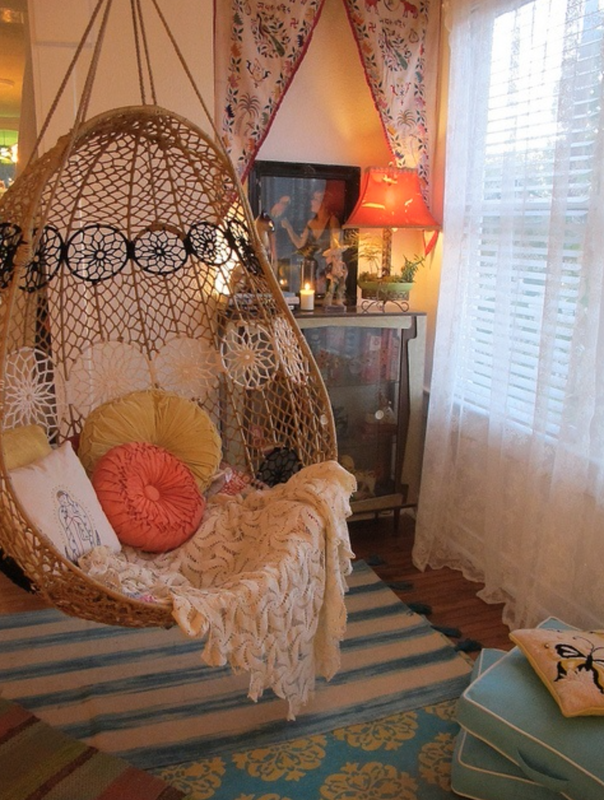 Hanging Macrame Chairs. Yes, you need to get this installed properly… but this is really all you need in a room to take it over the edge! 6. Feather garland! 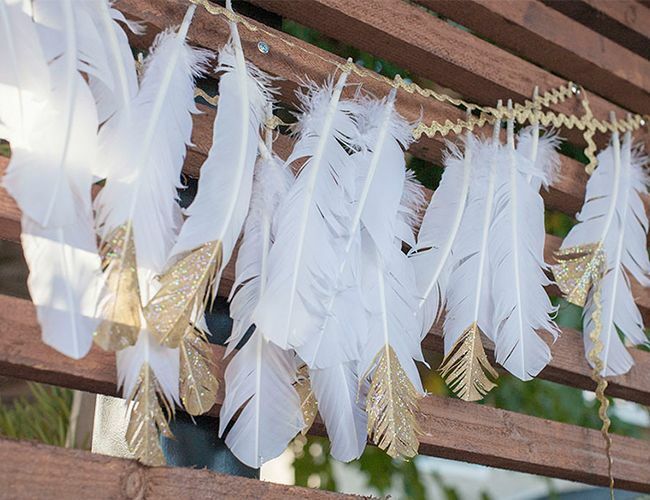 You can tie found feathers to twine and string up magnificence. You can paint them or just leave them be in their natural splendor. Simple ideas to more nature and calm are always found in the boho. While my home itself isn’t typically bohemian, there’s definitely a lot of hippie chic happening, and as time goes on, it grows! Can you find a way to bring more free-spirited nature into your space? Let me know… I am always on the hunt for great ideas! Previous post: 10 Body Language Tips To Be Awesome In Front Of A Crowd! Next post: Bright Thoughts Light Up Your Life!